"I know you're doing something big. I want in." Just in case the average theater wasn't a big enough screen to see Will Smith and Margot Robbie pull off a big con with a romantic twist in Focus, you may be happy to hear that IMAX has decided to release the film on their giant screens the same day the film hits traditional screens. And to go along with that release addition, a new IMAX trailer has surfaced showing off a whole bunch of new footage. While I'm not sure this needs to be seen on an IMAX screen, the more I see of the film, the more interesting it looks, especially with a seemingly fun role for B.D. Wong in there. Watch! 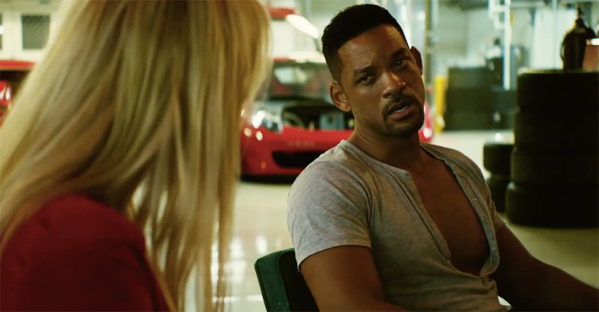 You can still watch the second US trailer for Glenn Ficarra & John Requa's Focus right here. Let me guess, she is working smith the whole time. I'm just not feeling this movie. Im not sure if it is Smith, or the whole grifter plot. I just get the vibe that this wont be too good. Dat Margot tho.....d. a. m. n.
Ummm. Ok. Keep on trollin bud. I don't know, I just don't seem to care about Will Smith movies anymore. His schtick has just worn on me I guess.